On my first trip to Adelaide a back in 2002 I saw a bike that has stuck in my mind to this day. It was a Ciombola and had gold plated chain stays that caught my attention. 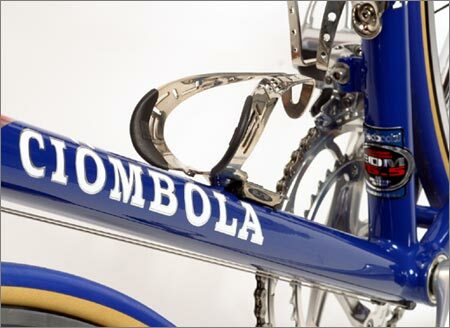 At this year’s Tour Down Under, I had a chance to speak with Michael Abel, one half of the team behind the Ciombola label. 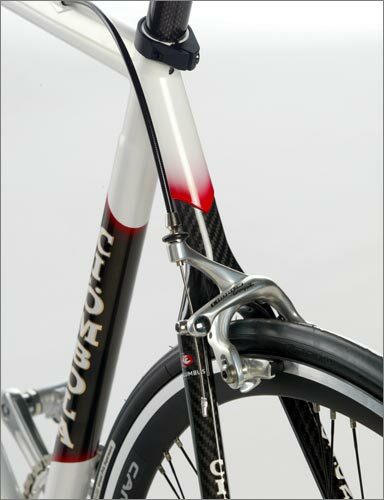 Ciombola is a high end frame builder based in Melbourne Australia, who make their frames solely from Columbus and Dedacciai steel. The interview started with the tables turned, Michael was asking about my background to gauge his responses. Being in the last year of my Industrial Chemistry degree was more than an ample for the up coming conversation. 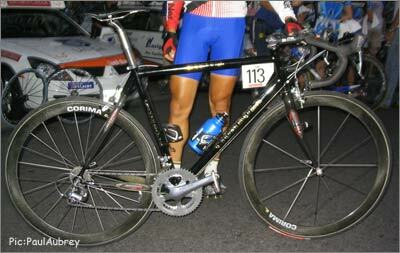 As seen at the TDU – a Ciombola complete with gold chainstays. Pez: Firstly so how do you pronounce Ciombola? MA: Choombola would be the best way of expressing it. Everyone gets it wrong so we just let it slip. It is like people saying “colnaygo”, it just doesn't ring well with me. Pez: What are the origins of the name, I understand it is a slang term? MA: Its origins are specifically in reference to the emblems on cars. An emblem is a symbol of quality. It's pretty much an Italian slag term, it was a schoolyard thing that I heard when I was 15 and has stuck with me ever since. Pez: So how long has the label been around? MA: It's been around for pushing on 6 years now. The team is made up of Wayne Roberts (father of Australian pursuiter Luke Roberts) and myself. Wayne does all the geometric stuff and assembly while I do the more technical selection of tube sets. There is the third silent partner in Trak Cycles. Pez: What are your backgrounds? MA: Wayne Roberts has about 25 years of experience building bicycles, he came from the aviation industry. Wayne was also a successful road racer. I have two degrees in applied and pure mathematics and have been riding bikes for years. Pez: What has been the association between Luke Roberts and Ciombola? MA: Luke rides on the Ciombola when he is in Australia and Com-net's frame supplier when he is in Europe. Luke is riding a new Ciombola frame at this year's TDU, which is a prototype that will no doubt be in demand once seen by the public. It is a special Dedacciai EOM16.5 tube set with Black Tail Race seat stay and Mono Box chain stays. The fork is another Deda, the Black Magic 2. The bike is running a special oversized seat tube. Pez: The first Ciombola I saw had gold chain stays, how is this achieved? MA: They are electroplated just like you would with chrome. The thickness varies, it's not a specific thickness that we try to achieve but more a depth of finish. Due to the nature of electroplating you tend to get heavier deposits on corners and end points. 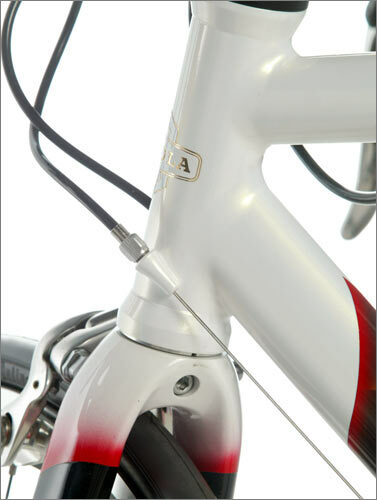 The lack of uniformity is one of the problems you typically have with chrome plating, the dropouts collect a lot of the plating. The chain stay gets assembled into the frame after it is plated. We are deleting the plating as a custom option in the context of warranty as it is out sourced. Pez: The gold has both aesthetic and functional benefits? MA: Gold is aesthetic, for pure function you would pick chrome. Chrome is a lot harder and a lot more resistant to buffing. Chrome will still look a 100% after many hard years of riding. For people with a low Q-factor, we have seen the gold chain stay buff off. It wasn't intending to be a pretentious appearance, it does it job by not chipping. Another nice thing about the gold is that it lowers the risk of internal corrosion in comparison to using chrome. MA: I think the customer drives everything. Our relationship with the customers is a very intermit one. The attention to detail is driven more by the end user than me on the drawing board. So for us to achieve the right result is more about asking the right kinds of questions of the client. What do they like? We're not in the business saying this is the best, we are in the business of say this is going to be just what you want in the context of what we do. 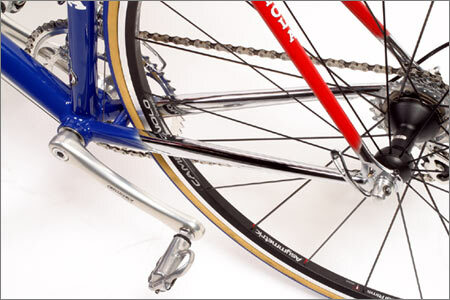 Designing a bike is like going to an architect, interior designer or tailor. You give them a design brief, this is what I would like it to do and these are the things that I like. We fit the product to the brief and start asking more questions about what make them tick. Quiet often people just don't know what they want, they just want one like they saw in RIDE magazine. Whether or not it is the right one for them, they have started out with an objective desire so it take a lot more time to get to the end result than it does picking something off the rack and I hope you like blue! I generally spend 6 or 7 hours with people before we even discuss the group set they are after. It can be very time consuming but worthwhile. Every single one of bike that goes out is a pride and joy. Pez: How does Ciombola approach quality control? MA: When you have one person doing everything on the frame you have continues quality control. When works get passed from one person to another on a production line, and even to the point of a finished frame going to a painter then to the person boxing and sending them, there are risk elements that can't be controlled. We have total quality control because one person is responsible from start to finish. That is all that is required, you can see every step along the way. There is no substitute for Wayne's 25 years of experience. The type of people who are buying a boutique brand, are the kind of people who understand how quality control is applied. In manufacturing processes there is a mortality rate and things go wrong, how does that get picked up and who is accountable? We are 100% accountable, there are only two of us involved, a designer and builder, nor a network of dealers who can get the blame.